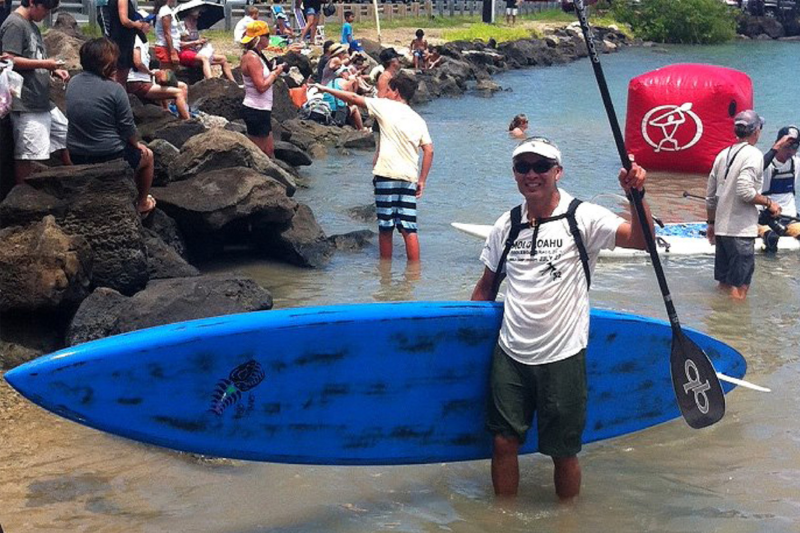 Like most keiki from Oʻahu, Jeff Chang learned how to surf at Canoes surf break in Waikīkī. Lying prone on an oversized longboard, five-year-old Jeff uncertainly gripped the waxed-up sides as his father pushed him onto an ankle-biter wave. This first ride, in the same waters that Waikīkī’s original beach boys pioneered surfing culture, propelled Chang into a lifetime of ocean sports. In the years to come, he’d go from crossing Canoes’ short paddle out to crossing an entire channel between islands. To call Chang a sports enthusiast would be an understatement. 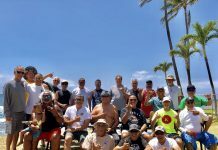 Now at 61 years old, the Hawaiʻi Kai local has 13 sports and counting on his track record which includes outrigger canoe paddling, windsurfing, and a couple Ironman Triathlons and cross-country skiing races. Out of this diverse list of land and water sports, Chang is best known for stand-up paddle boarding (SUP), a sport he helped to pioneer for Hawaiʻi when it took to the competitive stage in 2006. “Whenever something new comes, I just try it, no matter what it is,” Chang says. “Stand-up paddling was new and it looked pretty cool.” Having experience in surfing and prone paddleboarding, the waterman proved to be a natural when he first tried SUP in 2005. With the help of his friend Doug Lock, also a novice to the sport at the time, the two started to experiment with SUP in downwind conditions. On the continental U.S. and elsewhere internationally, SUP races usually took place in flatwater conditions. But in Hawaiʻi with its already existing lineup of downwind races for outrigger canoes, prone paddleboards, and surf skis, it was inevitable that SUP would become adapted to similar race conditions. “Back then they had kayak races and they would let us [stand-up paddlers] enter, make a special division for us,” Chang explains. 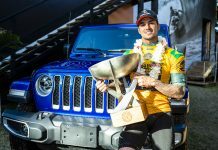 “So we were kind of like the stepchild back then.” Fortunately, it wasn’t long until this rising group of athletes gained access to the most prestigious race course in Hawaiʻi—the notorious Kaiwi channel. 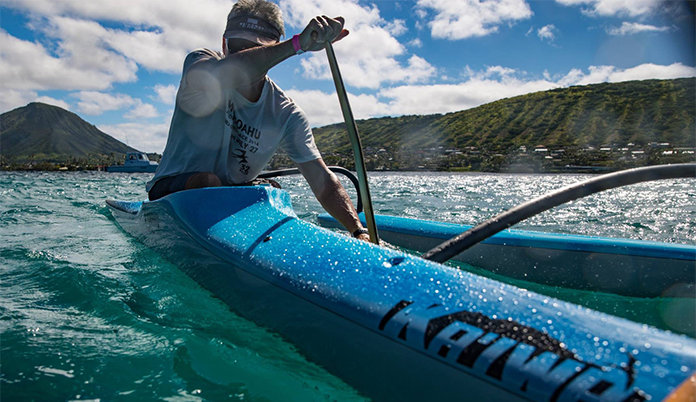 In 2006, the Molokai 2 Oahu, a 32-mile-race across unpredictable waters, initially created for prone paddling, included its first SUP division. Chang entered in the solo SUP division two years later, finishing with a fairly lengthy time, he admits. But he recalls that race with fondness, having trained for it with Morgan Hoesterey, who became the first woman stand-up paddler to cross the Kaiwi Channel, and on a stock board with no rudder for that matter. As for Chang, the race turned out to be a mere warm-up to get his nerves out. He returned as a solo competitor the following two years, earning two consecutive first-place finishes in his age group. In this year’s Molokai 2 Oahu Paddleboard World Championships, Chang paddled his way to another first-place finish in the men’s 60-69 age division, also making him the second fastest time in the two age divisions below his. “Racing is about how much pain you can tolerate,” Chang says, grinning. “I have a higher threshold for pain, which means I can suffer a little bit more.” He adds that during his triathlon days, tests found that he has an abnormally high V02 max, meaning he’s able to utilize large amounts of oxygen during exercise. Chang regards these two factors as gifts from God. Recently, Chang has picked up another sport to add to his diverse list—hydrofoiling. When there’s a swell on the North Shore of Oʻahu, Chang and a friend will head out to the same spots they’ve spent tow surfing, except now they’re way out past the break, hydrofoiling on the forming swells. “I don’t really need to do [tow surfing] anymore, any death-defying stuff,” Chang laughs. He’s more than satisfied with his new hobby that, of course, he’s been taking to downwind conditions. With hydrofoiling substituting SUP out as the newest water sport, Chang now has the chance to repeat history and pioneer another sport for Hawaiʻi. “With this group [of foilboarders] everyone is friends,” Chang explains. “Whenever you see a guy foilboarding, you paddle up to him and compare notes. What kind of foil do you have, what kind of board do you have?” With the rise of social media, the learning curve is much faster, according to Chang. He recalls a recent viral video on Instagram of a person running with a hydrofoil as if it was a skimboard, jumping on, and pumping in seemingly flat water. “I don’t think I want to try [that trick], it’s for young kids,” Chang laughs. With such an extensive history in ocean sports, one can only wonder why Chang never tires of being in the ocean. “I get out in the ocean to think,” Chang explains. “Even when I’m trying to solve a problem at work some of my clearest solutions come out of paddling.” He adds, “[SUP}is good mentally to keep you sane, not having to worry about anything except for what the water is doing. It doesn’t have to be SUP. Just being out in the water is healing.” And Chang is right. It doesn’t take a Kaiwi Channel crossing to come to this enlightenment. It only takes one moment in the ocean to spark a lifetime dedication to it.